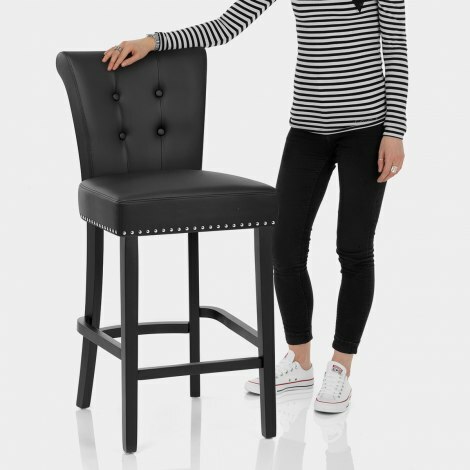 Elegant and eye-catching, the Buckingham Bar Stool Black Leather is a truly luxurious piece for your kitchen or breakfast bar. Sumptuous black bonded real leather covers the sprung and belted seat, which is edged with chrome studs for an opulent touch. Offering style and support, the backrest includes chic button detailing and is complete with a scroll top design for a classic look. Below, the solid wooden frame has a satin black finish and is strengthened by bracing bars that also double up as a footrest. Allowing for use on a range of surfaces, protective pads are included on the underside of each leg, making the Buckingham Bar Stool a perfectly practical model.